7" student scissors feature straight plastic handles and built-in Microban antimicrobial product protection that inhibits the growth of bacteria that causes stains and odors. Ideal for cutting paper, craft projects and more. Stainless steel blades are corrosion-resistant. 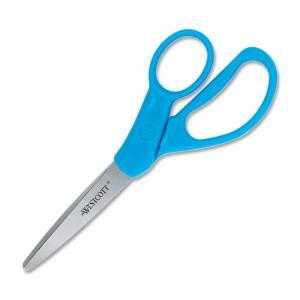 Scissors are designed for left-handed or right-handed cutters ages 12 and up.